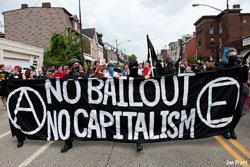 Last week, the G-20 Summit in Pittsburgh, Pa. (Sept. 24-25) met with a series of protests that brought together a reenergized layer of activists spanning the labor movement, environmental justice groups, anti-war organizations, progressive churches and the radical left. 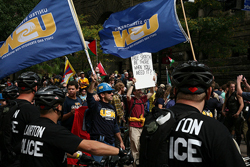 The run-up to the demonstrations was marked by meticulous preparation that consumed the summer for many dedicated Pittsburgh-area organizers, protracted legal battles that lasted into the week of the demonstrations, and the logistical challenge of bringing activists accustomed to routine trips to D.C. to an unconventional location. Despite the considerable calculations that went into organizing for the G-20 and the general anticipation of the coming crackdown, those who took part in these days of action couldn’t help but be caught off-guard—for good and for bad. Direct actions on Thursday, Sept. 24, led by hundreds of students and anarchists working with the Pittsburgh G-20 Resistance Project, garnered national attention. The severe police repression meted out against protestors has been documented widely by vigilant activists and mainstream journalists caught in the fray. News of the unprecedented domestic use of LRAD sonic weapons spread rapidly via social networking sites and word of mouth. Stun grenades, tear gas, and attack dogs comprised the rest of the arsenal deployed in the otherwise largely barren streets of Steel City. Dozens were detained. Direct actions continued in the face of unremitting police brutality, culminating in a convergence of hundreds of activists at the University of Pittsburgh late Friday night, in which around 110 people were arrested. For the duration of the summit, police roamed Pittsburgh-area schools indiscriminately using crowd-control weapons as if in some idiotic and violent reverie. Rumor had it that an unsuspecting group of frat boys at Carnegie Mellon University got a taste of urban warfare on their way to a party on Thursday night. One wonders how many people may have been deterred from attending Friday’s People’s March by this spectacle of unabating and widespread repression. However, as promised, the march was “legal, peaceful and permitted,” and drew roughly 5,000-7,000 activists. It reached its peak at a mid-point rally in downtown Pittsburgh, where one organizer announced to the jubilant crowd that this was the largest demonstration Pittsburgh had seen since the Vietnam War. Though comparable in size to the past few mobilizations in Washington, D.C., the People’s March outstripped those marches in terms of a number of factors. Though bottom-lined by anti-war activists, it successfully brought together a range of activists that recalled the original global justice protests. 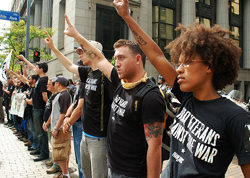 Anti-war and other social justice activists left feeling galvanized. Given the challenges presented by geographic distance and the steep downturn and subsequent dormancy of global justice organizing in the United States, this marks the People’s March as a definite—if qualified—success. One hopes that this experience will give a boost to the activists who have been working tirelessly to reconsolidate a new core of anti-war and global justice activists. We will no doubt find ourselves in the streets soon enough: either on October 17 to protest the war in Afghanistan, or in Georgia on November 20 to take on the School of the Americas—a yearly institution that has taken on a fresh urgency given the increasingly horrific coup d’etat in Honduras. But as we build for a rapid succession of demonstrations this fall (and certainly not just against the war), we need to attend to the work that doesn’t make the papers—the work necessary to achieve the unqualified success we’ve been seeking since the invasion of Afghanistan in 2001. After the streets, there’s the slog: Organizing among the sectors that can truly stop the war—counter-recruitment activism and support for GI resistance—and education in our communities, churches, workplaces and schools. Though the round of organizing against the G-20 has now come to a close, the moment to educate is still wide open, as word about the demonstrations spreads. And activists should seize this moment to reinvigorate the conversation around long-term organizing that the U.S. anti-war movement desperately needs. Troop levels are about to be ratcheted up in Afghanistan, and the question of whether or not the U.S. is fighting “the Good War” lingers on. Watch this space for more detailed reports, assessments and thoughts on next steps from key local and regional organizers for the G-20 protests. We encourage people to leave their impressions or link to articles about their experience in the comments. As I understand it, the meetings of the G20 are closed so there is only a press announcement at the end. So what did they resolve at this session? * The big deal is that the G20 will become the premier of all such meetings, not the G7 or G8. This supposedly incorporates more players into the process–although clearly it’s Washington and the Europeans who are still the driving force. * The various financial ministers also decided they wanted the [capitalist] world to be a more stable place and pledged to bring this about, but if you believe they plan to do anything positive, I’ve got a bridge I’d like to sell you. * The event will probably be known for President Obama’s speech, at which he called out the Iranian government for their attempt to hide the building of a new nuclear facility. No mention was made of the fact that the United States has the largest nuclear arsenal in the world, and is the only country to have used nuclear weapons. What I found most amazing was not the G20, but the incredible police [mis]training, new riot gear equipment and use of force that went into the event. I’ve read that the preparations and new equipment amounted to more than $20 million! I was trying to find news about what was actually discussed, climate-wise, inside the G20 meeting. Apparently there was agreement on medium term phase out of fossil fuel subsidies and deferral of real plan-making to the next meeting. President Obama was the one to introduce this topic but didn’t propose a timeline for action in his speech. “Richard Betts, head of climate impacts at the Met Office, said that if current CO2 emissions trends continue, the world could warm an average of 4 degrees Celsius by 2100, with devastating effects. Does anyone know who called for the 10PM gathering? I had seen people handing out fliers and they looked oftly suspicious. First, the fliers were only 6 words long and were anonymous, the person who tried to hand them to our group didn’t talk to us at all and only tried to hand them to folks dressed in black all the while she was smiling. I heard some speculation that the cops may have been behind this and no one has come forward as the group that called it. Just wondering what others heard.